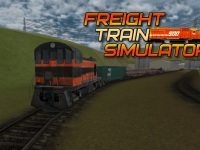 Freight Train Simulator is a train simulation game in 3D graphics. The main mission is to drive a heavy-class cargo train to the target terminal during the interval specified. If you exceeds the time specified before getting to destination, then you lose the mission and have to return to the starting point again. Moreover, when the train is passing on a curved railway, make sure it runs on lower speed. The train speed should be under 50 kmph, or it will undergo a derailment accident. And the company will likely depose you. While the train is running on straight railway track or on less-curved one, it is allowed or even recommended to boost the train into maximum speed to reach the targeted interval. Meanwhile, when it is approaching the finish point, make sure it stops before the end of railway. Do not crash the train. Accomplish all 10 missions with various time and distance. The game succesfully depicts all objects including the train, railway, and other natural objects in smooth graphics. Everyone will love this game. No violance or bloody accidents. You only deal with time and speed. Drive the train as fast as possible while being wary of the curved railway. Mouse = Look around in 3D view. Scroll mouse = Zooming out / zooming in. A virtual racing game using the Volvo cars around highly detailed and realistic tracks.